During our discussion, I asked John what is the definition of a “Big Band” and he quickly said they usually have about 20 musicians and singers. The standard line-up is five saxophones, four trombones, four trumpets, 3 to 4 rhythm instruments (piano, bass, guitar and drum) and one or more singers. He went on to explain that not all “Big Bands” are called Big Bands. They may also be called Jazz Orchestras, Jazz Bands or Swing Bands (the latter 2 terms can also refer to smaller groups). Bands that get together primarily for fun (vs. money) may also be referred to as rehearsal bands, reading bands, hobby bands, weekend warriors or ‘kicks’ bands. Who knew? In Calgary, Big Band musicians come from all walks of life, from high school students to 80+-year-old seniors; from enthusiastic amateurs to talented professionals as good as you would find anywhere. It is a true community. Some of Calgary’s Big Bands focus on dance music of the big band ‘swing’ era, while others are more into the jazz repertoire of the 1940’s to present. Most bands perform commercially available arrangements (charts), although a few feature compositions and arrangements by local musicians (i.e. Johnny Summers/Calgary Jazz Orchestra, Calgary Creative Arts Ensemble). You will find Calgary’s big bands performing in all kinds of venues – nightclubs, churches, Legions, community centres, schools and senior citizens’ centres are the most common. I digress. Arguably the best spot to experience Calgary’s Big Band on a regular basis is the Saturday brunch with Prime Time Big Band at the Ironwood Stage & Grill in Inglewood (now in its 13th season and likely the only regular event of this kind in Canada). Every two weeks, the 20-piece Prime Time plays a new program to packed houses. All ages and backgrounds come to hear music ranging from Duke Ellington classics to The Big Phat Band’s exuberant contemporary tunes. Founded 20 years ago by bandleader Dave Jones, Prime Time’s membership is made up of almost all of the city’s most veteran jazz musicians, including Eric Friedenberg (on saxophones and woodwinds), Al Muirhead (on trumpet and flugelhorn), Brian Walley (on trombone), Kai Poscente (on bass) and John de Waal (on drums), playing alongside more recently established local pros and invited international guests. Hint: Order your tickets early, as it is almost always a sell-out. If you are interested in a specific band’s performances they are usually publicized via each band’s own mailing list, website and Facebook page. Another good source of public performances is the JazzYYC website (jazzyyc.com). Given what must be hundreds, if not thousands of big band musicians calling Calgary home and many thousands more attending their concerts, it puzzles me that Calgary has struggled over the past 25 years to create a vibrant and viable Jazz Festival or a jazz club (like the now closed Beat Niq). Towell disagrees, “The rumours of demise of jazz in Calgary is highly exaggerated. The JazzYYC Society has revived Calgary’s Summer Jazz Festival after superstitiously avoiding the “F” word for a couple of prior years’ events. And a scan of events on the JazzYYC website, or in Calgary Herald’s Swerve magazine, reveals Calgarians can get out and hear live local jazz musicians almost any day of the week. Go listen!" Recently I posted a slide show of black and white photographs of every day places and space in Mexico City that was very well received, however, several readers also pointed out that Mexico is known for its splendid colour. I too was overwhelmed by the colour of streets of Mexico City and one of the reason I chose to take some b&w photos was to see how the city looked without all of the colour. Based on reader feedback, I decided to put together a slide show that would capture the wonderful colour of the everyday people and places of Mexico City. I hope you will enjoy the slide show. Below is the Mexico City: Noir slide show if you'd like to compare. This blog experiments with a cinematic-like film-noir style of still photography. While in Mexico City, I took several black and white photos to see how they might capturing and interpret the city's architecture, people and places I encountered on the streets. I have selected, edited and sequenced the photographs in a way that I hope tells an ambiguous story without context or words. The viewer is invited to make sense of this series, and becomes a collaborator in the mystery of the story. I debated on the use of music to accompany the images or not and in the end I decided to incorporate some music. I would love feedback on this 3 minute experiment. Downtown YYC: Paint it black! Hosteling: A Home Away From Home! Back Story: When my Mom said she wanted to go to Mexico City to see the Our Lady of Guadalupe shrine early in 2015, I thought this would be a great opportunity for us to go together (we had never before, just the two of us, travelled together). I had also been reading much about the City’s urban renewal. An added bonus was my Mom loves staying in hostels (Blog: Discovering Hostels in your ‘70s and ‘80s) and I have always wanted to give it a try. The Hostel Suites offered us a private room (with full bathroom) and free breakfast for $38 CDN/night (including the 10% discount because my Mom is a Hotel International member). The location was great, just a few blocks from the Hidalgo Metro station and an easy walk into the Historico Centro (150-block historic district) full of museums, churches and shops, as well as an easy bus ride to Our Lady of Guadalupe shrine. At the airport, I hopped into a taxi with my Hostel Suites destination and address written on a sheet of paper; however upon showing it to the driver he looked puzzled – not a good thing – but headed out. The taxi ride was like a car chase scene from a movie - he cut in and out of traffic, headed up back alleys and side roads to bypass the traffic jams. Let the adventure begin! Arriving save and sound at the Hostel Suites, I quickly took note we were across the street from the Plaza Revolucion Hotel (4.5 star) and half a block from Krystal Grand Reforma (4 star) – a good sign! Hostel Suites lounge. The wall mural was painted while we were there and completed for the "Day of Dead" dinner. Hotel Suites at night. There is a coffee shop and restaurants next to the entrance and across the street in the Plaza Revolucion Hotel Hotel is a Tequila bar. The receptionist (located in a tiny space, under the stairs in the long hallway entrance) greeted me with a smile, knew that I was arriving and my room was ready. Good first impression! I was given a quick tour of the TV room, kitchen (with large fridge for guests’ use), two lounges (one with a beer fridge) – all these rooms no larger than what you would find in a typical Canadian home, the exception being the kitchen – it was smaller than you would find in a 500sf condo. Not our bedroom. Yes you can get queen beds and rooms with TVs. Our room, a barren large concrete box had two single beds, a bunk bed and a small desk; no pictures on the walls. The bathroom was large, with a sink and metal industrial lockers off the bedroom and a separate toilet and shower area next to the sink. This could work, I though! Heading to the lounge for a beer ($1.20 CDN), I was quickly invited to join in a conversation about current world politics, travel, music and movies with group of six young adults from London, Perth, Amsterdam and New Zealand. We then all headed out for something to eat (found a taco stand where we got 3 tacos for $2.40 CDN) and then back to the hostel’s lounge to continue our marathon discussion until 1 am. For my entire stay, I was treated to wonderful conversations at breakfast, happy hour and late evenings. Interesting to see how the future of mankind is viewed by 20 and 30 somethings from other countries. There was no talk of golf handicaps, aging parents, health issues or home renovations! Over the 18-days, I realized it was not only an age thing but you view the world differently when you are travelling for 6 months at a time (which seemed to be the average length of their adventures) vs. a couple of nights or weeks vacation. Travelling the world for extended periods of time definitely opens your eyes and mind. I think I cramped my Mom’s style a bit on this trip as usually when staying at a hostel, she mixes and mingles with others, even hanging out with the “kids” at times, but with me hanging around, she didn’t do that. The picturesque dock area is jammed with colourful boats all painted pretty much the same. They make wonderful reflections in the water. However, we had one major adventure with a “hostel tribe”, when eight of us headed off for an afternoon to Xochimilco, a quaint village with a wonderful market. The village is known as the Venus of Mexico for its colourful open air trajinera boats that float along canals bordered with amazing fields of flowers, garden centres, homes (large and small) and surreal, naked doll installations. This involved our first trip on Mexico City’s crowded subway and then transferring to another train. Once there, we walked to the dock (not really knowing where we were going) where the trajinera were. After deciding how long we wanted our boat trip to be, we negotiated a price for the boat and then again for beer and food from the boat vendors along the way. It all happened very smoothly. After our boat ride, we wandered the streets to find a bar for more drinks and to soak up the ambience of the village, before making our way back to the train station for our return trip. A great day! The peaceful and serene canal at the beginning of the trip is soon replaced by numerous vendor boats selling beer, food and musical entertainment. These dolls hanging from the trees and fences along the canal in various places make for a surreal experience. The Xochimilco market was a beehive of activity of merchants, deliveries and shoppers. It was full of colour and smells, exactly what a market should be. Wonderful display of flowers along on of the streets at the Xochimilco market. Flowers are big business in Mexico City, with incredible displays in almost every church we went into. One of the reasons I wanted to go to Mexico in late October/early November was to experience the “Day of the Dead” festival. Little did I know that one of the traditions of the Hostel Suites is to host a party for guests. The staff (and owner) prepared all the food and dressed up in their Day of the Day attire, hosting all 50 us to what I imagine to be a typical family “Day of the Dead” Party. How authentic is that! Me, my Mom and Hotel Suites owner. One of the great things about staying at a hostel vs. a hotel is how much more relaxing it is. I think it has to do partly with expectations. When you stay at a fancy hotel, you expect everything to be perfect – room décor, staff and food. As a result everybody seems to be a bit stiff, trying to make a good impression both the uniformed staff and the other guests. When people sit in a hotel lounge, rarely does anybody already in a conversation invite a stranger sitting near them to join in a conversation – yet this is a common occurrence at Hostel Suites. The hostel is like being at home - people slouching on the couch watching TV, (usually soccer), others on their laptops and still others are in the kitchen/dining room. In the morning, people came down for breakfast in their sweat pants and t-shirts, wet hair and no make-up. I didn’t live in residence at university but I imagine pretty much the same scenario. Everyone was relaxed. Nobody was trying to impress anybody. People mixed and mingled easily. There was no menu at breakfast. Everyone had the same thing - a bowl of fresh fruit, a couple of pieces of toast (the homemade Black Currant jam was to die for), the daily feature (I loved the quesadillas) and coffee. And yes, you could ask for more if you wished. There were no fancy omelettes, frittatas or eggs benedict, no espressos either. It was relaxing not having to make a choice. Everyone just seemed happy with what they got. Unlike a hotel, there were no extra pillows or towels at the hostel. In fact one day (we did have daily housekeeping service) they replaced my towel with something that I would have thrown in the rag bag, but a request for a new towel was quickly answered and we moved on. The bed’s mattress was very firm and to my surprise, it suited my back better than ours at home. The sheets were thin but fine given Mexico City’s warmer climate. The hostel receptionists did double duty as concierge. Every day we told them what we wanted to see and they would print out a map with how to get there (bus, metro or walk) and suggest what to see in the area or along the way. They arranged our day trip to Teotihuacan with a local tour company. They were as good as any 4 or 5-star hotel concierges I have experienced – always friendly, smiling and helpful. When it came time to leave, they even had a fixed-price private car service to take us to the airport (35 minute ride) for $18 CDN. Our 18-day stay at the hostel cost us a total of $684 CDN – many would pay that for a weekend getaway. Hotel Suites inviting lounge chairs. The lounge had a great patio ambience with just a plastic sheet covering the rooftop opening high above. Doesn't this shout out "Relax." Safety was never an issue at the hostel with a 24-hr receptionist. We had card key locks just like a hotel. While the streets around the hostel were visually a bit rough, I never felt unsafe during nightly walks which took me off the beaten path to find local street vendors, quaint family restaurants and cafes, as well as small parks and plazas. I would definitely stay at a hostel again and if I go back to Mexico City, I would stay at the Hostel Suites. It quickly became my home-away-from-home. Hosteling isn’t for everyone and I am not sure it is for me all the time, as I too love the plush towels, bathrobes, nicely decorated rooms and other frills that come with a luxury hotel. And I am definitely not sure if I could stay in one of the shared rooms with shared bathrooms (what my Mom usually does when travelling alone). Not all hostels are created equal. Some people moved to Hostel Suites from another hostel because theirs was too noisy from partiers. Though many guests said Hostel Suites had the smallest hostel kitchen they had ever seen, many were able to cook up some tasty-looking meals. If you are curious about staying at a hostel, I encourage you to try it. You might like it and your wallet sure will! San Miguel: An Experience Of A Lifetime! I posted this blog last winter and after a recent day of exploring downtown Calgary inside and out it looks to me like some of the windows haven't been changed since last year. Shame on those retailers and restaurants who complain about lack of business, but do nothing to entice people to come downtown and shop. I can't believe some of the dark forbidding windows on some of the restaurants. Who wants to go into a black hole. As many Everyday Tourist followers know, I love taking photographs of the wonderful collages created by the reflection of buildings, street life and window displays while flaneuring shopping streets. Recently, I was flaneuring along Stephen Avenue Walk (Calgary’s downtown pedestrian mall and home to two department stores, three indoor shopping malls and dozens of shops and restaurants) thinking that given it is Holiday Season, I would find some great reflections. Boy, was I wrong! Other than a few of Holt Renfrew’s street windows and the thousands of cascading mini lights from Bankers Hall's skylight, I was hard pressed to find any Christmas/Holiday decorations. Many of the windows didn’t look much different than any other time of the year. I’d bet money some of them haven’t changed in over a year. Bankers Hall's cascading lights has become an exciting and enchanting downtown tradition, that creates a unique sense of place for both shoppers and office workers. Unfortunately none of the other downtown shopping and office complexes have been as innovative and imaginative. Riley & McCormick Western Wear and Lammle’s Western Wear & Tack both have flagship retail stores on Stephen Avenue. What a great opportunity for them to do something fun and unique with their large windows for the holidays based on a western wear fashion Christmas. Arnold Churgin Shoes, Winners, Sports Chek (Canada’s largest retailer of sporting goods in Canada and a Calgary company) and Out There (high end outdoor clothing retailer) also have flagship stores on the Walk, but you wouldn’t know it by their “bah humbug” windows. It is surprising that Arnold Churgin Shoes on Stephen Avenue doesn't have spectacular windows not only at Christmas, but year-round. Winners has never capitalized on the potential of its large Stephen Avenue windows as a sales and marketing tool. Indigo Books' huge window on Stephen Avenue is hardly what you would expect from a major retailer during the holiday season. Stephen Avenue needs more than just holiday lights to make it an attractive place to shop. Thank goodness some of the smaller independent stores got into the Christmas Spirit along Stephen Avenue. Fluevog Shoes got into the Christmas spirit. I am thinking this suggestive party cracker themed window by Holt Renfrew turned some heads? 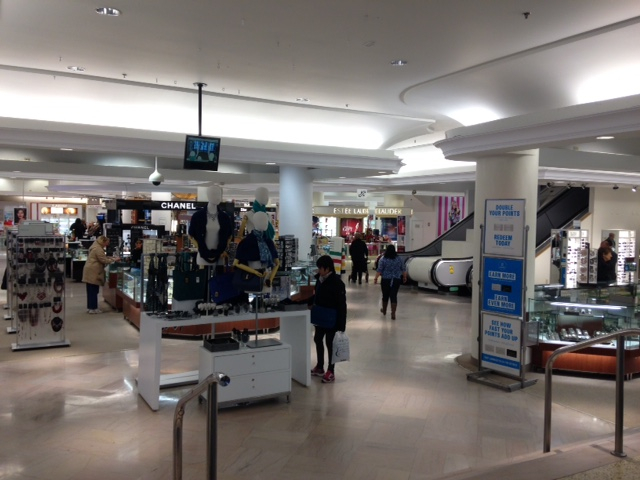 Inside Holt Renfrew is much more conservative with its decorations inside the store. I always thought the purpose of a flagship stores was partly to build the company’s brand. There was no sense of animation or excitement to invite you to go in, or portray that this would be an interesting, fun place to do some Christmas shopping in any of these stores. Hudson's Bay flagship store’s windows along Stephen Avenue are nothing short of pathetic. Along Stephen Avenue they announce a new development coming soon if you look in the window it looks like nothing is happening. The main entrance windows on 1st Street SW just off the Walk has a tired looking generic perfume banners having absolutely nothing to do the holidays. Even when you walk into the store, there’s no sense of celebration, no sense that this is a special place to shop. The entrance to Hudson's Bay's historic downtown store makes no reference to the Holiday Season. The window looks the same a year later. It doesn't get any better inside the store. Then there’s Flames Central (aka Allen/Palace Theatre) a major event centre. I don’t think they’ve changed their windows since they opened, which must be at least 10 years ago. Even when you go inside the shopping malls (Bankers Hall, The Core and Scotia Centre) most of the retailers have ignored the power of exciting and enchanting windows, to make the tens of thousands of pedestrians who pass by the windows every day – stop, look and potentially come in to shop. Brass Monocle in The Core shopping centre is known for its imaginative windows, yet there is no attempt to make them festive for the Holiday Season. Guess' window features their dresses but nothing says, "This is Christmas..."
Downtown Christmas shopping used to be a tradition, not only in Calgary, but in cities across North America. Department stores like The Bay and Eaton’s would have wonderful Christmas windows with animated Christmas or winter scenes that attracted families from across the city to come downtown to shop. In most major cities, the annual downtown Santa Claus Parade attracted tens of thousands of spectators/shoppers from across the city and was the traditional kick off of the holiday season. Today only few major cities have a parade and with a few exceptions the downtown department stores (those that still exist) don’t even bother with a Santa’s Village. Kudos to the Calgary Downtown Association for organizing weekends with Santa at Devonian Gardens and Olympic Plaza, as well as for their lighting up Stephen Avenue at night, but without the help of retailers (indoors and out) creating fun, festive windows and shops, it is pretty much pointless. My route into downtown takes me through Kensington Village and one of the first retail windows I encountered was Purr. I was expecting more from this funky fashion retailer in the way of a seasonal window display. Walking the streets of Kensington Village the celebration of the holiday season is a bit better. Kudos to Battisella Developments for their Christmas tree and to the Business Revitalization Zone for banners, Christmas hanging decorations and weekend activities (roaming Santa, Elves and horse drawn wagon rides. However, the windows of the majority of the retailers, restaurants and cafes still are pretty much devoid of any sense of the holiday season. Fortunately as I wandered further into the Village I found more windows like this one - The Rocket T-shirts - that had fun, funky and festive windows. No wonder more and more people are shopping online; the thrill of shopping in person is gone. I'd love to hear from readers what it is like in the suburban malls and Calgary's other shopping streets - 9th Ave, in Inglewood, 17th Ave. in Beltline or 4th Street in Mission. This is just one of several trees I found decorated next to the sidewalk that made my walk home more pleasant. On my way home, I noticed several homeowners had decorating their street trees with Christmas ornaments. This got me thinking wouldn’t it be great if the merchants along Calgary’s pedestrian streets did the same to the trees in front of their stores. It would add some fun and festivity to what can be a pretty drab pedestrian experience in our winter season. Stampede 2015: Have we lost that luv'n feeling? Happy Hour capital of North America is where? Bet you can’t guess where the Happy Hour Capital of North America is? It is definitely not in one of the 23 US states that have banned happy hours. And, it is also not in Alberta where, in 2008, the Alberta Liquor Board set strict pricing guidelines for all drinks limiting Happy Hour pricing to 8pm. So where is it? The Sauce magazine waiting for us with some other goodies at Hotel Monaco, Seattle. One of the take-away memories of a recent trip to Seattle was the Happy Hour Experience. A magazine called “The Sauce (The Definitive Guide to Eating and Drinking in Seattle)” provided us with a comprehensive list of all Seattle Happy Hours - I stopped counting at 600. Arriving on a Wednesday at the historic Mayflower Park Hotel we were informed there are two Happy Hours – one in their Oliver’s Bar where there were free appies and one with free wine tasting in their lovely Andaluca Restaurant. Mayflower Park Hotel's Oliver's Bar before happy hour. Happy hour at Andaluca restaurant in Mayflower Park Hotel is very civilized. A few days later, when we moved to the Hotel Max iknown for its incredible contemporary art collection, we found out they have a free craft beer Happy Hour. Yes, every day, guests wander back to the hotel lobby (aka living room) to enjoy free draft beer, meet and chat with strangers and watch the wonderful sidewalk ballet on the street outside through the big picture windows. The early birds get the good seats, as this quickly becomes a standing room only event. The Happy Hour fun didn’t stop there. The Hotel Monaco with its captivating, comfy guest rooms (ours being like an Andy Warhol installation with lots of bold accent colours, playful art and cloud wallpaper over the bed) was tough to leave. But again, a free wine tasting downstairs was too big a draw. Each day. The concierge picks a different wine to feature; often sourcing wines from boutique Washington wineries. And with very liberal pours he invites you to comeback for seconds. Samuel Beckett watches over happy hour at Hotel Max. A full pour at Hotel Monaco. Calgary is not without its Happy Hour culture. Ask around and you will discover Calgary’s after work socializing is on the rise. Hotel Arts, on Thursdays from 4 to 8 pm, offers free live music curated by local singer/songwriter Amy Thiessen paired with $4.99 pints and trendy RAW Bar cuisine. Mikey’s Juke Joint in SunAlta offers a Friday Happy Hour with free live music. A musician from Mikey’s stable of musicians hosts each one, including two of Calgary’s most talented musicians - Tim Williams (winner of the 2014 International Blues Challenge in Memphis) and Steve Pineo (Calgary's entry into the 2015 International Blues Challenge). Google "Calgary Happy Hour" and you won't find a comprehensive list of 600 happy hours anywhere, the best I could find was a November 4, 2014 list by John Gilchrist, published in Avenue Magazine title "25 of Calgary's Best Happy Hours." For a long time, Calgary’s downtown and surrounding urban neighbourhoods were criticized for not having a robust, after work Happy Hour culture like Montreal, Toronto or Vancouver do. In the mid to late 20th century, Calgary’s downtown workers were commonly known to quickly flee to the ‘burbs after work. However, this had changed significantly in the past decade with the emergence of Stephen Avenue Walk (SAW) as one of Canada’s best restaurant rows. The 300 block of SAW, with its 200 floors of offices, is centre ice for downtown GABEters (geologists, accountants, bankers, brokers, engineers) with the likes of The Metropolitan Grill and Local on 8th. The 21st century has also seen the emergence of Calgary’s Beltline as one of North America’s best urban communities with its warehouses along 10th Avenue (replacing 11th Avenue or Electric Avenue as it was known in the ‘80s) as the hangout spot for the “young and restless.” Here, mega beer palaces like CRAFT Beer Market, National Beer Hall and Commonwealth Bar and Stage are bustling places helped by the fact the Beltline is a haven for 25 to 34-year olds in Calgary (a whopping 43% of the communities population falls into that YUPPIE age bracket). It is not uncommon to see a line up waiting to get into their favourite Beltline watering hole at Happy Hour. Kensington Village is also emerging as an after-work hot spots like the Oak Tree Tavern. Bridgeland too is now home to the very chic and cool Cannibale cocktail bar. While Calgary may not have as comprehensive a “Happy Hour” culture as Seattle, it does have a mushrooming “after work” socializing culture. Mexico City is rumoured to have over 150 museums and I don’t doubt that number. There seems to be a museum or two on every street in the 150-block historic centre (Centro Historico), as well as many outside it. My mom estimates that over our 18-day visit, we visited over 30 museums. Quite frankly, I lost count. Built in 1964 and designed by Pedro Ramirez Vazquez, the Museo Nacional de Antropologia (MNA) still looks very contemporary - flat roof and huge central plaza largely covered with a 275-foot canopy balanced on a 36-ft pillar decorated with European and Mexican civilization reliefs. Unlike many new museums and art galleries in the late 20th and early 21st century, the architectural design of MNA enhances, not competes with the artifacts. Just as it ideally always should. The museum is unique also in that the ground floor, dedicated to archaeological finds from ancient Mexico - each room dealing with a particular civilization or region of the country - allows you to wander outside into gardens and courtyards thus recreating an “in situ” experience with the artifacts. I loved the outdoor reconstructions of the Mayan temples and Monte Alban Tomb. This is a huge museum with 23 exhibition rooms on two levels, covering 800,000+ square feet and sitting on almost 20 acres. While most people we talked to spend about 2 hours at the museum, they must have been running through it. I think all North Americans should visit this museum to develop a better appreciation of our collective history – the artifacts and stories are compelling. Time: Could easily be 4+ hours. While you are in the area, you might want to check out the Mexico Zoo or the Chapultepec Castle at the top of a hill in the middle of the park of the same name – both are close by. There are also two other smaller museums nearby - Museo Tamyo and Museo de Arte Moderno. Tamayo's bold and beautiful mural graces the entrance to Mexico City's insightful Anthropology Museum a "must see" for all North Americans. The museum's courtyard has a zen-like atmosphere. This single pillar not only holds up the entire canopy, but it serves as a powerful waterfall and relief sculpture. The museum is gracefully designed to enhance and respect the sense of place created by the artifacts. It is part of Mexico City's wonderful connectivity between the past and present. The entrance to the first gallery tells the story of man's evolution on the planet earth. The gallery spaces are spacious but not overwhelming, making for a enjoyable experience. The exhibition spaces are a wonderful link to the architecture and artifacts of past cultures. One of the many gardens that link the indoor galleries with outdoor spaces to create a unique museum experience. Found this Mayan mural when I stuck my head into one of the ruins spaces it covered all the walls and roof. I couldn't help but immediately think of Picasso's Guernica and how the early Mexican cultures foreshadowed many of the 19th and early 20th century European art practices. The upper floors of the museum showcase information on the diversity of indigenious cultures in different parts of Mexico. It was interesting to see this image, after encountering two young men wearing contemporary deer heads masks in the Zombie Walk. When you see an artifact like this you quickly make the connection to the iconic skull-like face paintings of the "Day of the Dead" festival. Found this one-eyed figure painted on a artifact and was stuck by how contemporary it was. As an urbanist, this panel made me realize that Mexico City has centuries of architecture and urban design to build upon. I realized how infantile we are in Calgary. This panel was enlightening as it illustrates how violence and war has been part of Mexico's (and many other nations') culture for thousands of years. It is very hard for Canadians to understand this. A private museum of Carlos Slim, one of the richest men in the world, it is named after his deceased wife Soumaya Domit, designed by his son-in-law Fernando Romero and engineered by Frank Gehry and Ove Arup. The six-story building is an uber-contemporary design with its flat base (perched above the sidewalk) and roof anchoring a twisted tower that gives the building a tension and shape that defies description. The 16,000, shiny, hexagonal, aluminum tiles (supplied by a company owned by Slim) are like the skin of a snake. Opened in 2011, the museum anchors the Nuevo Polanco district, which includes several other contemporary office, hotel and shopping centres including a modern Costco across the street. Inside, you are greeted by a huge, stark white minimalist lobby that is home to just three artworks - murals by Mexico’s iconic artists Diego Rivera and Rufino Tamayo and the renowned sculpture “The Thinker” by Rodin. This is just the beginning of your exploration of the 66,000 pieces of art including the world’s largest collection of pre-Hispanic and colonial era coins. If that isn’t enough to make you want to go, how about seeing the largest collection of casts of sculptures by Auguste Rodin outside of France. Its a “who’s who” of works by modern European artists like Dali, Picasso, Renoir, Miro, Monet, Matisse and van Gogh. The museum is easy to navigate thanks to ramps that wind their way up the side of the building, similar to Frank Lloyd Wright’s iconic Guggenheim Museum in New York City. The galleries are full of art and artifacts that appeal to all ages. Time: Give yourself at least two hours to explore the museum and another hour or so to explore the area’s architecture and shopping. As well, Acuario Inbursa, one of the world’s top aquariums, is located across the street. This museum is diametrically opposed to the Anthropology Museum as it shouts loudly - "Look-At-Me" design. The shape and the facade skin make the building very photogenic. Inside the lobby and staircases are as cold as ice, which contrasts with Mexico's culture of warm and colourful artifacts and murals. The top floor sculpture gallery is a bit of a free-for-all of sculptures. These dark powerful Rodins figures are centre piece of the gallery. Dali's sculptures provide the comic relief. The Palanco community around the museum is full of modern buildings that make for some interesting exploring. Note the green wall on the right; this is one of many green walls in Mexico City, including one that covers the entire entrance wall of a parkade for probably 200 + feet. An equestrian statue of Charles IV guards the entrance to the National Museum of modern Mexican art, which opened in 1982. While the art is spectacular, the Ministry of Communications and Public Works building (completed in 1911) is the star of this show. In the words of my mother, “this museum is worth a visit for the building alone.” Our Eyewitness Travel book agrees, “Its double staircase, in bronze and marble, is enclosed by a semi-circular staircase, three stories high. The interior, with its intricate ironwork and many candelabra, is sumptuous.” We agree; we were in awe! The artwork spans the time from 16th century to mid 20th century, with excellent examples of works by Mexico’s great muralists - Rivera, Siqueiros and Orozco. The collection of Mexican monumental religious paintings from the 16th to 19th centuries was a real eye-opener, never before appreciating the quality and depth of Mexican art. At points in our visit, we just had to sit and rest, as the art and architecture were overwhelming. The ornamentation of this building was spectacular. The three-floor spiraling stair case was jaw-dropping. Just one of the many ceiling paintings. They were truly heavenly! The colour in this photograph is real, it was an assault to your senses. I will let the other images speak for themselves. This is a painting of Mexico City in the 16th century. Not the lake and mountains in the distance. Today the lake is gone and the city is climbing the mountains, severing as a reminder of how urban sprawl has existed from centuries, it is not a late 20th century phenomena. When flaneuring the hardware district, we happened upon this museum because of its cathedral-like, art deco building amongst a mish-mash of buildings with facades covered with gaudy signage. The museum brings together folk art from all over Mexico, from traditional to contemporary pieces, representing the country’s cultural and geographical diversity. The exhibition spaces and displays were world class. The museum is best known as the sponsor of the yearly Noche de Alebrijes (Night of the Alebrijes) parade in which fantastical creatures are constructed on a monumental scale (some up to 25 ft high) and then paraded about 10km from the Zocalo to the Angel of Independence monument. We missed the parade, but we did see the 200+ creatures on the street the next day, which made for a free, fun outdoor gallery experience. A highlight of our visit to this museum visit was seeing a school tour of very excited junior high students who seemed to love everything about the museum. Of course, my Mom had to chat with them and they were only too willing to practise their English. The streets surround the Popular Arts Museum are full of hundreds of small shops selling "Home Hardware" type goods, including the kitchen sink. The classic art deco building was originally the Fire Department Headquarters. The interior courtyard of the building has been glassed over to create a wonderful gallery space that looks like a modern South Beach Hotel. The colourful Alebrijes creatures in the distance bring the space alive in a fun folk-art manner. The windows in the courtyard were used to display items from the collection. I loved the exquisite interaction of the reflections of the artifacts and architecture. The galleries were full of exhibitions of crafts of all kinds. These devil creatures captured by imagination. The workmanship of the objects was outstanding. The Alebrijes creatures on parade on the sidewalk next to the Angel of Independence monument. This museum is a hidden gem – it took a bit of searching to find it on our last day, but my Mom wouldn’t give up and I’m glad she didn’t as it has, in our opinion, the best collection of murals in Mexico City. Bonus – there was no line up (in fact, we had the entire place to ourselves). This former convent, which dates back to 1639, has hundreds of Diego Rivera murals from 1923 to 1928, illustrating the diversity of his artistic practice and influences – Italian frescoes, cubism and pre-Columbian Mexico. The ground floor is dedicated to the glorification of labour - rich colourful paintings and monochromatic portraits depicting scientific, artistic and intellectual pursuits. On the staircase and second floor are a series of landscapes and state emblems from different parts of Mexico. The third floor showcases stories about the Revolution including one of his Rivera’s signature pieces “The Arsenal” where his wife, artist Frida Kahlo is shown handing out guns to the revolutionaries. It was a reminder of how much political revolution and violence has been part of Mexico’s history for centuries. While most visitors line up to see the Palacio Nacional with its iconic murals, temporary exhibitions and gardens, our recommendation - if you are pressed for time - is to come here instead. All of the walls of the building are covered with murals each telling a story of the lives and rich history of Mexico. Untitled, Diego Rivera (Note the deer head on the shaman-like figure. Rivera was very interested in the ancient cultures of Mexico as he was the modern art of Europe). This Museum is the actual house where Frida Kahlo was born, lived most of her life, painted some of her best works and died. Generally, not a big fan of famous peoples’ homes that have been turned into shrines, I was thus not impressed when we first arrived and had to line up. We had been spoiled to this point of just walking into museums and having them pretty much to ourselves. However, we got to chatting with some young people in line about our thoughts about Mexico City and their insights into what is it like living and growing up in Mexico City - the time did pass quickly. The house and gardens where a delight to wander, even if it was too crowded for my liking. The house was donated to the nation in 1955, by Kahlo’s husband Diego Rivera shortly after Kahlo died. As you would expect, the home is full of Kahlo’s artwork, artifacts from her studio and everyday items and artifacts she collected. This includes a lovely collection of small religious paintings on metal called Votive paintings, which interested me having purchased one for our art collection earlier in the week. I also found the simple, cartoon-like, giant “Judas” figures made out of paper (later I learned these are burned on Easter Sunday as a symbolic destruction of evil) both playful and eerie. One of the surprises was the contemporary display of some of Kahlo’s dresses and personal belongings. Especially spooky was the black dark room featuring her corsets (in lighted glass cases) that she used to hide her body (it was disfigured by childhood polio and a near-fatal traffic accident that forced her to have over 30 operations, including a leg amputation in her later years). It certainly added to the surrealistic experience, as did the lovely garden oasis – a sea of tranquility in a life of torment. Time: 1 hour to tour the museum, but you should give yourself 30 minutes in the line-up (you can purchase tickets in advance). If time permits, the Museo Casa de Leon Trotsky is near by and/or the Coyoacain community which is full of cafes, shops and parks. Kahlo's Museum had the best "Day of the Dead" altar that we found in Mexico City. Like Rivera, Kahlo was interested in both past and present cultures. This was a display of her dresses. There were dozens of Judas figures like this one scattered around the house. I chose this one as it seemed to relate to the suffering and hardship of broken body that Kahlo experienced in her life. Located in the heart of the Doctores neighbourhood, this museum, located in a five-story office building, is definitely off the beaten path. However, for urban explorers and those who love toys, it is a “must see.” In fact, it is more like an antique or flea market than a museum as there are no fancy display cases, no labels with titles, dates and artists’ names, no information panels and no security guards. In fact, the main floor sells toys that could easily be extras from the museum – you will not confuse it with a typical gift shop. The museum was started by Roberto Shimizu, a Mexican of Japanese descent, who began to hoard every toy he could get his hands on since the age of 10. Most of the 20,000+ toys, games, dolls etc. date back to mid-20th century. One of the highlights for me was the small peddle-cars. Backstory: My Mom tells me I loved my peddle-car so much they had to replace the tires! The museum is absolutely chockablock full of toys, piled up everywhere, making you have to step over and around them in this hoarder’s dream. There is a “thrill of the hunt” atmosphere to the museum with lots of smiles and giggles from parents and children. Time: Give yourself about 1.5 hours depending on how much you are into toys and nostalgia. There is not a lot else to see and do in the vicinity of the museum. Mexico's Toy Museum office block. What would a toy museum be without truck and planes. The museum is full of vignettes like this one of small toy people. There are many home-made toys and displays like this one. Note how the inside is filled with figures. One of about 10 pedal cars. I wish I had one of these as a kid...it might have changed my life. Every toy museum must have toy soldiers. The museum is full of fun displays like this one of yo-yos. This flying saucer fill of robot vignettes was perhaps my favourite piece. I was constantly amazed during my adventure in Mexico City how their contemporary culture still seems to evolve around evil, death, religion and spirituality. It made visiting the museums seem more relevant and authentic, with the strong connectivity between past and present in Mexico City. You could easily plan a 7-day vacation in Mexico City just around visiting these seven museums. Be aware too that many of the museums are free on Sundays for Mexicans so they can be quite busy and distract from the experience, so we suggest choosing a less popular museum on Sundays if possible. Also, many museums are closed on Mondays, an exception being the Museo Soumaya (open Mondays and closed Tuesdays) making it a good destination for a Monday adventure. Recently, I embarked on an 18-day adventure in Mexico City to see what could be learned about city building from a mega city. “How can you compare Calgary, a city of 1.2 million and just 100 years old, with Mexico City, a city of 21 million that’s five centuries old?” you ask. While there were many differences and some similarities, the biggest revelation was an appreciation for how people in Mexico City experience personal and public space. Calgary is a very private city - we love the privacy of our cars, our single-family homes (often with six-foot fences and attached garages), our 6,000+ parks, playgrounds, green spaces, plazas and 800+ km of pathways all of which give us the option of not having to mingle with others. Mexico City is the complete opposite - families work, play and even dine on busy sidewalks and 75 percent use a very crowded pubic transit as their primary mode of transportation. A typical home or apartment is a third the size of an average Calgary home. Young children quickly learn how to live without much personal space. Babies are carried (no humongous strollers) until they can walk, then they just walk alongside their parents everywhere. In Mexico City a popular activity is reading the newspaper on the sidewalk. Family dining on the street in Mexico City. In Mexico City you don’t live in the entire city, but one of the 16 boroughs (ranging in size from 116,000 to 1.8 million), which are further divided into 160 colonias. While this is somewhat like Calgary with its four quadrants and 200+ communities, the density eight times greater than Calgary’s. How is that accomplished? Surprisingly, not with a lot of highrises but rather with homes having no front yards, backyards or driveways, as well the average home being 70% smaller than Calgary’s. In fact, many homes are called “informal homes,” i.e. self-built on “found” vacant land. Only recently has the City adopted more formal zoning and building permit processes. Also there are few schools with huge playing fields, large community playing fields, green spaces and no dedicated dog parks. I didn’t see a single huge surface parking lot anywhere. Like Calgary, homes in Mexico City’s inner city are the most expensive, but unlike Calgary, its suburbs are where the low-income, transit-dependent, working class live. Mexico has one the most extensive and well-used transit systems in the world; the subway and buses are packed from 7 am to 10 pm, a far cry from Calgary where its transit is only heavily used for a few hours in the morning and afternoon on weekdays. Transit fare in Mexico City is ridiculously cheap at 40 cents per trip. Despite being packed in like “sardines-in-a-can,” sellers jump on the subway trains, pawning everything from USB keys to BIC pens. Backstory: Vendors are literally everywhere on sidewalks, including in front of new iconic office buildings. Can you imagine The Bow or Eighth Avenue Place’s plazas/sidewalks being occupied by dozens of haphazardly placed vendors? A crowded subway car with vendor selling trinkets for Day of the Dead in Mexico City, mid-afternoon. Upscale vendor sheds on the sidewalk in front of one of Mexico City's newest office towers. Having transit operate at capacity all day long does not mean less road traffic road in Mexico City; the main streets are probably 20 times more crowded with cars, buses, taxis and delivery trucks than Calgary. A constant, ear-piercing symphony of honking and traffic police whistling accompanies the dance of pedestrians and vendors on crowded, narrow and uneven sidewalks and roads. Mexico City’s historic district (a 150-block rectangle) has several pedestrian malls that are crowded all the time - on the weekends it’s like Stampede time in Calgary. These malls have no seating, but do allow cyclists and in some cases, even cars (only to access parkades). One street has 200,000 pedestrians per day! On one street I counted 30 different shops on just one side, not including the street vendors – no wonder they are busy. It is a free-for-all on many Mexico City sidewalks; in comparison Calgary is a pastoral place. Check out the video below for a sample of Mexico City's street symphony. Sidewalk dining on a side street in Mexico City. Mexico City has lots of market streets like this one that are a free-for-all, while at the same time full of life and energy. Whoever coined the term “messy urbanism” must have had Mexico City in mind. There is garbage everywhere, partly due to no garbage cans anywhere and to the streets being filled with thousands of food and retail vendors with all their accompanying waste. The City has also lost the battle with graffiti; it exists on pretty much everywhere. There is a totally different urban aesthetic in most of Mexico City. The streets are a beehive of activity with people coming and going, setting-up or taking down their stalls, cooking, eating, selling and buying – messy, but alive! Avenida Presidente Masaryk in the upscale Polanco district is devoid of people, like many of the sidewalks in Calgary's urban districts. Could it be that pretty streets are empty streets? Crowds quickly gather waiting to cross the street in Mexico's historic district's pedestrian malls. Typical Mexico City sidewalk ballet. Like Calgarians, people living in Mexico City love their public spaces. The Zocalo square, the second largest plaza in the world (Moscow’s Red Square being the largest) is always crowded. Calgary’s equivalent would be Olympic Plaza. In the 18 days I was there, it was used for a huge book fair, world archery championship, major concert and Day of Dead activities. The Monumento `a la Revolucion plaza is also huge with the monument/viewing platform in the middle, underground museum, two huge flat plaza areas as well as sunken, flat hard-surfaced areas activities like soccer and dog play. Calgary’s equivalent might be Shaw Millennium Park. Check out the video below of how Revolution Monument plaza is used for an outdoor dance studio. We also saw it used for a street performance and wedding photos and lots of other informal activities. People trying to get to and from Monumento a la Revolucion plaza for a major event. Boulevard road in the middle of Bosque de Chapultepec. Mexico City’s parks are more urbanized than Calgary’s with buildings, attractions, vendors, formal walkways and lots of benches, while their plazas are simple, open spaces with little ornamentation allowing them to be multi-purpose spaces. In contrast, Calgary has lots of parks, most left natural, while our plazas are heavily ornamentalized. The "art of sitting" is popular everywhere in Mexico City. While Calgarians always seem to be on the move (walking, cycling or jogging) in our parks and pathways, Mexicans have mastered the art of sitting, talking, people watching and engaging in public affection. (Couples young and old love to hug, cuddle and kiss in public and people of all ages hold hands in the streets.) I was surprised too at how they loved to have their pictures taken by strangers. Collectively, this created an unexpected and lovely pedestrian friendliness in a harsh urban environment. Delivering toilet paper takes on a different perspective in Mexico City. Mexico City’s public spaces not only serve as a community living room, but also as their kitchen, dining and bedroom. It is not unusual in the evening to see a family dining at a street vendor, young children playing on the sidewalk while older children do their homework. In Mexico City the majority “live, work and play” in public, not in the privacy of a home. Let’s remember Calgary is only 100 years old. We have grown very rapidly in geographical size based on 20th century planning and regulations (good and bad) not organically and without public engagement and regulations over centuries, as is the case for Mexico City and many other vibrant urban cities. For Calgary, the 21st century will be one of infilling development projects (big and small), which will dramatically change our personal and private spaces. It has already begun and it is to be expected many will “kick and scream” about losing their privacy and personal space. Editor's Note: An edited version of this blog appeared in the Calgary Herald's New Condo Section on November 21, 2015. Calgary's Top 10 Public Artworks?????? Recently, I received a twitter message from @yycpublicart asking if I would be interested in collaborating on a blog about public art. Always interested in getting other people’s thoughts on Calgary I said “sure” and gave him my email address for further correspondence. In our short email correspondence, it seemed to me we had very different perspectives on Calgary’s public art. I am thinking this is a good thing, as it will give me some new insights. I responded I don’t think our collection is phenomenal and that we need more critical dialogue and that just “showing up to unveilings and blogging about it is not sufficient” in my opinion. I suggested @yycpublicart send me his top 10 public art pieces as a way of perhaps moving the discussion forward. 1. Chinook Arch: interactive lights that you can control with your cellphone! What else! Place making tool at its best. 2. Ascension: giant spiders by the Avtamsaka Buddhist Monastery marching into another plane. Couldn't be more poignant and appropriate. 3. Luminous Crossings: public art on LRT that spans across time and space AND changes colours to signify arrival of the trains. 4. The Same Way Better/Reader: giant 110' long mosaic mural with close to a million pieces of tile that took two years to design and make and that tells the story of Calgary. 5. Upside Down Church (aka The Device to Root out Evil) an upside down church balanced on its turret. AND it roots out evil. What else could one want? Unfortunately, this one has been decommissioned pending new location. The Device to Root out Evil, by Dennis Oppenheim, formerly located at Ramsay Exchange building along 24th Ave. SE. was removed in 2014 after the lease expired. 6. Bloom: A giant dandelion at the edge of St Patrick's Island that has "flowers" made from streetlights. 7. Outflow: A storm water drain that's an upside down/inverted topographical map of an outflow glacier (I believe). Serves to educate ppl on where water comes from, the various technique water services uses to treat the water, etc. I like pieces that educate and create a sense of wonder. 8. The Giant Blue Ring: Just cause I have built an 8' ring and I know how f@*#%*g hard it is. And how it started the debate in yyc about pooling of public art funding (which is a great thing) and it is fun to piss off people. 9. Poppy Plaza. Memorial drive WW1 memorial and public space in Kensington. Enjoy amazing views of the river, people watch, or simply hang out and soak in the atmosphere. 10. Wonderland. Cause it is a giant f'ing head and the probably the most photographed contemporary landmark since the Calgary Tower. Outflow, by Brian Tolle is located along the north side of the Bow River Pathway at Parkdale Plaza. Bloom, by Michel de Broin is located at the southwest corner of St. Patrick's Island. Poppy Plaza, by Marc Boutin architectural collaborative, is located on the southwest corner of Memorial Drive and 10th St. NW. Wonderland, by Jaume Plensa, on the plaza in front of the Bow office tower corner of Centre Street and 6th Ave SW.
“I sit on the yyc public art board of directors. I have run several (unrelated) placemaking projects such as Bow to Bluff (bowtobluff.org) and AudioMobYYC (AudioMobYYC.com). Sadko/Kabuki, by Sorel Etrog, Bow Valley Square – love the colour, the cartoon, comic sense of fun and playfulness that contrasts with the conservative, seriousness of a central business district. Charged Line, by Jill Anholt, South Calgary Fire Station - love the playfulness and cleverness…could be a wire or a hose…fits with the site. Re Me Fa Sol La Si Do by Joe Fafard, Hotchkiss Plaza - love the link with Calgary’s horse culture, but in a contemporary interpretation…love the scale and the subtle colour. Conversation by William McElcheran, Stephen Avenue outside The Bay – again, love the context of businessmen in the central business district on our iconic street, scale is perfect, love the way the public interacts with it…good public art should invite people to play with it. Sadko/Kabuki, by Sorel Etrog on the northeast corner of 2nd street and 6th Ave. SW. Conversation, by William McElcheran, on Stephen Avenue outside The Bay. Brotherhood of Mankind, by Mario Armengol, in front of old Calgary Board of Education Building - is another classic, Calgary is a very family oriented city, young city, energetic city and this artwork reflects all of those values for me. Again, love the scale and the fact that you can wander in amongst the figures. There is a bit of a schoolyard sensibility or ring-around-the rosie…which was appropriate for the site when it was the Board of Education. Giving Wings to the Dream, Doug Driediger, east wall of old CUPS building on 100 block of 7th Ave SE. I think this mural has held up very well for being 20 years old. Again I like the fact the piece relates to the site, which was home to Calgary Urban Projects Society when it was first commissioned. I think it talks nicely about Calgary as a caring city. It is well executed. Women Are Persons by Barbara Paterson, Olympic Plaza – again, celebrates Calgary’s history in a fun way and offers a chair for people to sit in and become part of the artwork. The public often interact with the piece leaving change or cups of coffee in the outstretched hand…very popular spot for tourists to take photos. Weather Vanes by Colette Whiten and Paul Kipps, on the southeast corner of Bankers Hall - connects well with Calgary’s sense of work, live and play. I love the way the pieces work with the surrounding architecture. There is a lot of synergy between the aesthetics of the art and the architecture. The Same Way Better/Reader by Ron Moppett, East Village at LRT overpass. Again love the colour the link to Calgary’s history and the sense of craftsmanship. I am a sucker for art that tells a story. Cloud Parkade (not sure what the exact title is but will find out) by Roderik Quin at SAIT. I think this is an amazing piece that is visually stunning and clever and utilizes new technology. It speaks to Calgary’s sense of place with its beautiful skies and clouds. I love how it changes with the sunlight. I love that it turns a parkade into a work of landscape art. And it is beautiful. When Aviation Was Young, Jeff De Boer, Calgary airport…makes me smile, love that kids can play with it like a giant toy. Love how it relates to the site (WestJet Departure and Arrival area). And love the craftsmanship. Women Are Persons by Barbara Paterson, on Olympic Plaza outside the entrance to the Jack Singer Concert Hall. Dream, Derek Besant, on +15 over 8th Avenue between 6th and 7th Streets. When Aviation Was Young, Jeff de Boer, WestJet arrivals and departures lounge, Calgary International Airport. These are not in any particular order which would require some more thought and I am not sure that is necessary to rank them. Yes I know there are 11. I don’t consider Poppy Plaza public art…it is a public space…and as a public space I don’t think it works to attract the public to stop and linger. I did love the Upside Down Church but wouldn’t include it as it doesn’t exist in Calgary for public viewing. Is it even in Calgary? Do you know? Unfortunately, I never heard from @yycpublicart after this email. Hopefully I still will and we can continue our discussion. In the meantime, I would love to hear from readers their thoughts on their favourite pieces of public art in Calgary. Full disclosure - I know I am weak on suburban public art, so would be especially great to hear from those in the ‘burbs about their favourite pieces. And, if you don’t live in Calgary, love to hear what is your favourite piece from the community you live in, or perhaps your all-time favourite piece from any city you have visited or lived in. Below are links to two great sites to find more information about public art in Calgary. Confessions of a public art juror. One of my criteria for a great urban experience is how many fun surprises you encounter while on your way to other places. Recently, while in Mexico City for 18 days, I was super impressed by the number and diversity of surprises my mother and I encountered – everything from coming upon thousands of locals participating in a Zombie Walk, to a plaza’s fun dancing waterfall with coloured lights that attracted hundreds of families and young adults on a Sunday evening. The first surprise happened on our first day when I unexpectedly discovered I could walk on 8-lane Reforma Boulevard (think Paris’ Champs-Elysees), as it closed Sunday mornings to allow cyclists, joggers and walkers to wander. After a few blocks, my second surprise was happening upon some 20 feet tall, colourful and fun paper-mache creatures. Soon I realized there were over 200 sculptures lined up like a parade on both sides of the boulevard. Hundreds of people, taking pictures and laughing at the imaginative sculptures that linked indigenous spiritualism and decoration with modern surrealism, created a carnival atmosphere. Everyone loves a parade, especially if there are fun, colourful and imaginative floats like these ones. In this case the floats were stationary and the people paraded around them. Sundays on Reforma were amazing with cyclists, joggers, pedestrians and public art. Who could ask for anything more? One of Reforma's traffic circles was turned into a fun playground. Caught these guys trying their hand at double-dutch skipping. How cool! On another day, I wandered to the Zocalo Square having earlier noticed new bleachers had been set up. I found a small crowd watching a dozen or so archers with their high-tech bows seemingly firing arrows randomly and silently to a target about 100 meters away. Alternatively you could actually stand by the targets and hear the “invisible” arrows “thud” as they hit the their targets – almost all of them dead centre or just inches away. Given there was no protection from a stray arrow; it was a bit of a hair-raising experience. I soon realized they were warming up for the World Archery Competition that was happening in the temporary stadium in another part of Zocalo. Pretty good shooting if you ask me? Loved how they use the area underneath the bleachers for swings. Later that same day, as we were wandering back from the fabric block (my Mom is an avid quilter), I was intrigued by a reflection in a bakery window and the word “Ideal”. Upon a closer look in the window we realized this was Pasteleria Ideal, the motherlode of bakeries - there were hundreds of people inside and we couldn’t see all the way to the back. Once inside we were in awe - this was definitely the biggest and busiest bakery we had ever seen. The size of a small department or grocery store (estimated 40,000 square feet), it even had a second floor gallery with specially decorated cakes for weddings, birthdays, first communions etc. The place was swarming with people many carrying huge trays (30 inches in diameter) heaping with their favourite breads and pastries. So mesmerized, we didn’t even buy anything that day. This was just one quarter of the store and you can see how packed it is with people. They truly were swarming around. This was just the pastry section of the store. The second floor exhibition space is much less crowded. Another surprise was the 20+ fire engine red shed-shaped metal structures that appeared one day in Alameda Central Park. Interesting-looking, but we had no idea what they were all about. The next day as we wandered by, we noticed they now had hammocks attached to them – which were all occupied. Later in the day, I figured out it was part of Design Week, which included dozens of pop-up displays and exhibitions throughout the city. Very cool! People of all ages and backgrounds loved the hammocks. Then one night we were kept awake by firecrackers going off every few minutes – my Mom was not happy. I was thinking this might go on for several days, as the Day of the Dead was still a few days away. The next then we encountered a small parade with people carrying statues of St. Jude and a small marching band. My mother, a devout Catholic, quickly realized we were at St. Jude Church and it was October 28th – St. Jude’s Day. They were simply celebrating this apostle and patron saint of desperate cases and lost causes. The street in front of St. Jude Church was packed with people buying statues and other items. It was like the Stampede midway. Perhaps the biggest surprise came when we got off the bus late in the afternoon of our first Saturday as we were heading back to our hostel. We found ourselves in the midst of tens of thousands of people (from infants to seniors) dressed up in gory outfits with makeup to match. “Was this the beginning of the Day of Dead celebrations?” we wondered. The procession of people was slowly walking from Revolution Plaza towards the historic city centre. Only later did we find out it was a Zombie Walk. Too fun! The Zombie Walk took over the road and both sidewalks with participants and spectators for several blocks. It was a blood bath! People of all ages joined the fun. These two girls crawled up to me as I was taking photos. Parents smiled and nodded "Yes" when I asked if I could take their picture. Then there was also our first Sunday when we decided to take an evening walk toward an eerie pink-lit building in the distance. Not only did we discover it was the monument at Revolucion Plaza that is lit every night, but that it has a large, fun, dancing fountain that attracted hundreds of people (young and old) to watch or run through it. The squeals and screams of happiness were infectious. People gathering around the fountain with the Revolution Monument in the background. It was like being in a surrealism painting watching people play in the fountain. One night we were treated to an impromptu performance of all women moaning, groaning and dancing on the plaza next to the fountain. Great public spaces allow for lots of spontaneous activities. Another popular activity was for young women to get dressed up like princesses and have their picture taken at the fountain. It was like being in a Disney movie. The BEST surprise was attending the National Lottery draw. Early in the day, we finagled our way into the art deco National Lottery building (who can say “no” to an 84-year woman politely asking questions in English) with its spectacular murals and auditorium. It turnout, a public draw takes place to choose the winning lottery numbers. As chance would have it, there was a draw that night at 8 pm. We didn’t give it much thought until we were just about back at our hostel and realized it was 7:45 pm and we were just a block from the National Lottery building. We decided to see if we could get in. Again, my mother thanks managed to talk our way in and we were treated to the most amazing evening of entertainment. As we headed for our seats, we encountered about a dozen young people (ages 10 to 16) in military uniform lined up waiting to get into the auditorium. No sooner had we taken our seats then they marched in and up onto the stage. After a flurry of hand-shaking and greeting of the head table dignitaries, the young people took over the night, managing the elaborate system of ball dropping and number calling/chanting – a spectacle almost impossible to describe. Watch the video and you will know what I mean. The public displays of affection that occurred in the parks, plazas and sidewalks was a delightful surprise. Everywhere we went, couples (young and old) were sitting on benches canoodling, not the least bit shy about it (they even liked having their pictures taken). We also noticed how handholding was very popular with people of all ages. Paris may commonly be known as the “City of Love,” Mexico City – in my opinion – gives it a run for its money. These couples saw me taking photos from a distance and smiled as I went by. I asked if they'd like their picture taken and they nodded "yes." Just one of dozens of photos of people hand holding in Mexico City. How many couples can you count holding hands in this photo? Our final surprise happened as we were leaving. My Mom, returning to our room after saying goodbye to the hostel staff, held two decorated sugar skulls – gifts from the Hostel Suites staff. The staff there are the best! Our home away from home in Mexico City Hostel Suites. We came to Mexico City for the "Day of the Dead" and Our Lady of Quadalupe shrine but left with memories of dozens of other fun, memorable and everyday surprises. Every city has their hidden gems - cafes, bookstores, pubs or shops - tucked away off the beaten path, that even some locals aren’t aware of. Here are five Calgary hidden gems for locals and tourists who like to explore off the beaten path. Who would think the little building with the blue awning on the Trans Canada Highway (aka 16th Ave N) is home to one of North America’s - if not the world’s - great antiquarian bookstores? Aquila specializes in books dealing with Polar Expeditions, Western Canadiana, Mountaineering and the Canadian Pacific Railway. As much a museum as a bookstore with antique maps, prints, photos, letters, postcards and scientific instruments, it even has an Inuit kayak hanging from the ceiling. Recently, owner Cameron Treleaven published Mount Everest’s 60th Anniversary book of George Lowe's letters written to his sister while climbing Everest in 1953. The book is signed by Jan Morris, Huw Lewis-Jones and Peter Hillary and includes a cutting of Lowe's sleeping bag used during the expedition, making this an extraordinary addition to any book collection. Note the Inuit kayak hanging from the ceiling - very cool! Every city needs a signature café. In Calgary Café Rosso in Ramsay’s industrial district is one of ours. Yes, they have other locations but this is the original Rosso with its own Probat L12 roaster, Marzzoco machine and Anfim grinder. They arguably serve up the city’s best espressos and lattes. It is also a great bakery for those craving a muffin, banana bread, scone or a tangy sandwich. Located in the 1927 Riverside Iron Works complex whose roots were as a small machine repair shop, which grew into a major steel manufacturer. Today, the site is home to many funky businesses including Ladacor Ltd., a sea container construction company and F&D Scene Changes fabricators of public art, parade floats, theme park structures, theatre and film set designs. Ramsay, one of Calgary’s oldest neighbourhoods, is a great place to explore on foot. Everyone loves Caffe Rosso in Ramsay! For music collectors, Heritage Music is THE place to be. Before going inside be sure to check out the wall of records on the north side of the building with remnants of the iconic Rolling Stones’ Tongue. Heritage Music's fun, funky and quirky street art facade. Midcentury modern maniacs will adore this little shop authentically located in the mid-century Spruce Cliff Shopping Centre. “Louche” is a French term for decadent, flashy, sketchy, dubious, shady and disreputable and “milieu” means an environment or setting, but there is nothing shady or decadent about Louche Milieu. Full of well curated treasures it’s a “must visit.” Plan around its limited hours, Friday and Saturday 12:30 to 6 pm or call to make an appointment 403-835-1669. Next to Louche Milieu is Little Monday Café, which serves up tasty homemade muffins and cookies with a full range of caffeine drinks. It is very popular with young families as evidenced by the chalkboard artwork. Lots of hidden gems here. Memorial Drive at 2rd St. SW parking lot. For those looking for a uniquely Calgary workout, try climbing the McHugh Bluff stairs. Not only will you get a great workout, but you will be rewarded with an amazing view of Downtown skyline, mountains and river valley from the top. With 167 steps divided into 11 flights, most people find once is enough. But there is fun challenge on the net, based on 10 laps starting at the bottom and finishing at the top. Don’t be surprised if you find yourself in the company of one or more Calgary Stampeders, Flames or a Canadian Olympic athletes working out. Bring your phone or camera as you are definitely going to want to take pictures. Lets make this challenging and carry my bike up the stairs also. Calgary is full of hidden urban gems...happy exploring. Love to hear from both locals and tourist what are your favourite! PS...no I have not taken up the Crescent Heights Stair Challenge. Recently, I spent 18 days in Mexico City with my 84-year old mom flaneuring Mexico City and was truly amazed by what I found. Our two key reasons for going - she wanted to see the Guadalupe shrine (she has travelled the world to see Roman Catholic sacred places) and I love cities but had never been to a mega-city, i.e. one with a population over 10 million. While Mexico City has a reputation of being smoggy, unsafe and gritty, what we found was a city that was safe, bustling with activity and had clean air except for two days. Yes it was gritty, but that seemed authentic for a city 500+ years old. We loved the unpretentious nature of the city and its people. Anyone who is into history will love Mexico City. The historic center is 150 blocks (give or take a few blocks) of historic buildings - some immaculately restored (Post Office Building and Palacio de Bellas Artes concert hall), some left to age gracefully (Palacio Nacional) and others in an advanced stage of decay. The City centre is chock-a-block full of monumental buildings oozing an mind-boggling amount of history. Today, we can build big buildings but I am not convinced they can be described as monumental. The literally sinking Cathedral Metropolitana, is the heart of the world’s largest Catholic diocese, took almost three centuries to build (1525 to 1813 AD) and is the second largest church in the world (only St. Peter’s in Rome is bigger) and you can just walk right in. You can even climb to the bell tower to look out over the Plaza de la Consititucion commonly known as Zocalo, the second largest plaza in the world (Moscow’s Red Square being the largest). There are even the remains of Templo Mayor, a 14th and 15th century Aztec temple unearthed in the 1970s - right in the middle of the historic centre of the city and another ruin on the edge of the historic district. An hour outside of the city lies Teotihuacan, one of the world’s most impressive cities of the ancient world. Founded before the Christian era, the city housed 125,000 people and covered 20 sq. km. It dominated the region until AD 650 before being destroyed (possibly by its own people) and abandoned. The name means “the place where men become gods” and it was later held sacred by the Aztecs. You can climb to the top of the Pyramid of the Sun one of the biggest pyramids in the world (the base is of similar dimensions as the Great Pyramid of Egypt but only half as high at 65 meters). Our day at Teotihuacan was memorable, not only for the two pyramid climbs (Sun and Moon), the walk along Avenue of the Dead, Jaguar Mural and Temple of Quetzalcoatl, but also for the mini-history lessons from our very enthusiastic tour guide. The tour also included demos for locals on carving, getting water from cactus plants and using plants for colour. It was mentally exhausting and exhilarating. Palaciao de Bellas Artes' Art Nouveau facade is equalled only by its impressive Art Deco interior that includes murals by some the greatest Mexican artists of the 20th Century. The concert/theatre space is magnificent and home to Mexico's iconic ballet company - Ballet Folklorico. The Palace Postal still functions as a post office and includes a contemporary art gallery space as well as a post office museum. The interior may well be the most elegant space I have every experienced. Climbing the Temple of the Sun was one of the most memorable experience of my life - I didn't think it would be a big deal. Just one of the many powerful carvings that remind you of human cultures that have existed in North America for centuries. It changed my perception of North America. Today every city seems obsessed with acquiring iconic public art, yet much of it is generic, i.e. it could be anywhere. For example, Anish Kapoor’s Cloud Gate sculpture in Chicago’s Millennium Park could easily be in Calgary’s Olympic Plaza or any urban plaza for that matter. In Mexico City, you won’t find a lot of modern public art but what you will find is the work of early 20th Century muralists – Diego Rivera, Jose Clemente Orozco and David Alfaro Siqueiros. From the 1920s to the 70s, these three Mexican artists created hundreds of murals documenting the historical, nationalistic, social, political and everyday living messages of the Mexican culture. I was captivated by the power of these murals in conveying a sense of the human struggles (work, passions and violence) that took place in Mexico before and after the arrival of Europeans. There is a wonderful sense of humanity and story telling in the murals, something that is often missing in modern public art. In good urban design, we talk about the importance of human scale of buildings (i.e. buildings that don’t dwarf people, usually under 10 or 12 storeys). Similarly, I think good public art should connect with local history and have a sense of humanity too. A segment of one of Diego Rivera's murals titled "In the Arsenal." Both the National Palace and the Secretaria de Educacion Publica are filled with Rivera murals that tell the stories of violence and passion of the Mexican people (both have free admission). At the end of our visit my mom commented, "Did you notice that most of his murals have a gun and military in them." There are supposedly over 250 museums in Mexico City and I don’t doubt it. It seems like there is a church and/or a museum on every block - sometimes both. Our favourite four museums were: Archeology Museum, Museum of Popular Art, Soumaya Museum and the Toy Museum. The Archeology Museum is huge with 23 galleries that tell the story of Mexico history from the arrival of man to present day. The artifacts and displays are perhaps some of the best I have ever seen. It is at least a half-day visit and possibly a full day if you want to really try to take it all in. The Museum of Popular Art is housed in a wonderful art deco building – a perfect setting for folk art. And the Soumaya Museum, outside the historic centre in Polanco, is an uber-modern architectural gem that houses the art and artifacts of Carlos Slim, the richest man in the world. It houses one of the largest collections in the world of Rodins in the top floor sculpture gallery. A hidden gem is the Toy Museum, otherwise known as Museo del Juguete Antiguo Mexico. Located outside the historic centre in a non-descript, four-storey office building, it is jam-packed with 55,000 toys. This is not a real museum in that the work is not curated or labeled with accompanying didactic panels. It is more like a flea market, with displays and vignettes from floor to ceiling – everything from foot-peddle cars to dolls, from robots to games. It is guaranteed to make you smile. Plaza de Santo Domingo is home to the Santo Domingo Church with its red volcanic rock a Tuscan colonnade for vendors and while we were there a modern art artwork with video inside. Funny story - the artwork in the plaza we had seen before in workshop space next to the Toy Museum where is had been the focus of some sort of artists' party the night before. I had a peddle car as a kid but not a cool as this one. When you think of Mexico City, you probably don’t think of great parks, plazas and boulevards – but you should! Bosque de Chapultepec is one of the great urban parks in the world. A public park since the 16th century, today it is home to numerous museums (Architectural, Tamayo and Modern Art), Castillo de Chapultepec (once home to Emperor Maximilian), a zoo (free) and botanical gardens. As well, Paseo de la Reforma, a 3.5 km boulevard (that connects downtown to Bosque de Chapultepec) once lined with beautiful houses, is today home to numerous skyscrapers (offices and hotels), as well as monumental traffic circle with a magnificent statues commissioned in the 19th century to commemorate prominent Mexicans. On Sunday mornings, the street is closed to traffic, allowing thousands of cyclists, joggers and walkers to use the street. Then there is the Monumento a la Revolucion plaza. It includes Porfirio Diaz’s unfinished congress building which was turned into a monument, museum and plaza. A glass elevator to the roof top deck offers outstanding views of the city. At night, the monument is surreal as it is lit up pink or blue. The plaza is used for numerous events from outdoor conferences to concerts. When we were there, it hosted six hours of Beatles tribute bands one Saturday and a lineup of Mexican bands including Jenny and the Mexicats the following Saturday. It was also used for some sort of convention for a couple of days during the week. A highlight of our trip was heading to the plaza on Sunday nights to watch people of all ages run through the colourfully lit dancing fountains. The shrills of excited, soaked kids will be a lasting memory of Mexico City. Monumento a la Revolucion towers above the surrounding buildings. The plaza encompasses a super block that provides space for a variety of activities and event. The museum is underground at the base of the monument. Enjoying a Sunday morning ride along Passeo de la Reforma. Note the playful, colourful sculptures in the backbround. They helped created a carnival atmosphere that will be the subject of a future blog. Young couple enjoying the temporary installation of red house shaped objects that supported a single hammock for Design Week. You definitely don’t feel like you are in a city of 21 million people when you visit one of Mexico City’s suburban villages. While most tourists just check out the Historic Centre village, there are many other interesting villages to explore. We especially loved the artists’ village of San Angel with its Saturday artisan market in the lovely Plaza San Jacinto, lined with cafes, galleries and restaurants. Coyocacan, its sister village, to the east is home to Museo Frida Kahlo, Museo Estudio Diego Rivera and Casa/Museo Leon Trotsky. I think every city should have a designated artists’ village. Though Xoxhimilco lies 20 km southeast of the city centre, it is definitely worth the trip. We joined six others from the hostel to catch the subway to the end of the line and then a train to this once lakeside village. Today, it is home to canals and semi-floating flower and vegetable gardens built originally by the Aztecs. Here you can rent a colourful punts (wooden roofed boats with a table down the middle) with a local boatman who poles the bunt along the canals. Beware: you will be accosted by other boats trying to sell you beer, food, trinkets and live music. The village is also home to a thriving farmers’ market, charming park and Iglesai de San Bernardino, a fortified monastery built by the Franciscans in late the 16th century. While travelling to this quaint village, along the way you will see what the working class suburbs of Mexico City are like and get a better appreciation of what a city of 21 million looks like. The Saturday Art Market in the Plaza San Jacinto hosts dozens of artists working in many different genres. There are hundreds of colourful punts at Xoxhimilco. Once you are on the canals it becomes a wonderful kaleidoscope of colour with the boats, the flowers and the reflections. There is something endearing about the people of Mexico City that I have never felt in any other city. The first hint of this came when walking through Alameda Park. Located in the city centre, it was once an Aztec marketplace. Today, it is 75 percent park (with restful pathways, huge trees and decorative fountains) and 25 percent tented vendors selling food, clothing, CDs and trinkets. It was here that we first began to appreciate how Mexicans have mastered the art of “sitting.” The park is full of ornate benches where people of all ages sit, talk, cuddle and kiss. While all around them is the hustle, bustle and honking of a big city, the park holds a tranquility that is almost surreal. Soon we began to notice that handholding is also very popular in Mexico City, not only with parents holding kids’ hands on busy streets, but also by couples (young and old), mothers and adult daughters and just friends. Somehow this handholding on busy sidewalks created a wonderful, subtle sense of tenderness and caring in what is definitely an intimidating, alienating urban environment. Finally, after visiting many churches and attending several masses, my mother observed that people of Mexico City had a spirituality that she has never experienced in any city she has ever visited - including Rome. She was impressed not only that every church had multiple masses every day, but that they were full. She also noted churches embraced a diversity of people from homeless to rich and were open all day long. One day a homeless man, in need of good bath, sat next to her at mass. He was respectful throughout the service and even found a coin in his pocket to give a donation. My mom befriended another homeless man who sat slumped on the sidewalk all day just a few doors down from our hostel. She would go out each morning and say Hi and he would wave to us each day as we headed off on our journey. Before we left for home, she said good-bye and gave him some money for which he gratefully thanked her. The streets of Mexico City are full of couples of all ages holding hands. Count the number of couples holding hands in this photo. Benches come in all shapes and sizes in Mexico City. One of the things we observed early were the number of families who love to hang out together in their public spaces. Two young girls crawling on the Revolution Plaza during the Zombie Walk. Everyone was keen to have their picture taken that day and everyday in Mexico City. Where in the world can you ride the subway for $.05 USA (yes, that is five cents), or get into a world-class museum for $5 USA or less (many of the museums are free). We stayed at the Hostel Suites (Youth Hostel) for $40 USA a night, which included a huge private room with two beds, breakfast, a full bathroom with a huge shower, daily housekeeping, two lounges/patios and the best staff I have ever experienced (their concierge services matched those at any 5-star hotel). Meals are cheap and you can get a beer for under a $1 USA. The all day tour to Teotihuacan was great value at $45 USA and front row seats at the Lucha Livre wrestling cost only $12 USA. After spending three weeks in Florence and Rome last year and 18 days in Mexico City this year, I would have to say Mexico City has more to offer historically and culturally than both of these major European cities combined. I encourage everyone to visit Mexico City at least once in their lifetime. Over the next several weeks, I will be blogging in more detail about Mexico City. I hope you will find the blogs interesting and intriguing. Dublin: FAB Fun in Libertines! Rome: A surprise playground lunch! This photo blog focuses on the offbeat people and places we encountered over 12 wonderful days of flaneuring in Florence in the Fall of 2014. It was an enchanting experience, from my favourite gelato shop waitress, to the husband and wife seamstress half a block down the street from our apartment who spoke no English, yet managed to help me find a new handmade belt. In between are photos from thrift stores to boutiques, galleries to street art, markets to churches, parking to cycling, fashion to food. In reviewing, my photos I noticed there were two major differences from our Dublin experience. One being the number of seniors in the streets of Florence and the second being the centuries of urban design that create a wonderful array of textures and light in its City Centre. We hope you will enjoy the photos and would love to hear which ones are your favourites. The ugliest pedestrian bridge in the world? No wonder Picasso painted faces as he did! Just one of many very stylish parking garages. I wish I could read Italian. A work of art and very tasty! Magritte would have loved this photo. Instead of tree lined streets, Florence has motorcycle lined ones. Would you drink out of this street fountain? Supposedly you can. Obviously I am not the only one taking a photo of this intriguing reflection. Florence comes alive at night. What was he thinking/feeling to create this drawing? Art is everywhere in Florence, yet there is very contemporary little public art. There is no lack of empty shoe boxes in Florence. Florence's finest were there to greet us when we arrived. These ladies were moving quickly. No line up at the Marino Marini Museum...we liked that! Once you get to the edge of the City Centre, the streets are much less crowded. Cars, bikes, scooters and pedestrians share the road. It was hard to go to sleep after discovering this church was open on one of our nightly walkabouts. Does it get any better than this? Taken from a balcony restaurant at lunch. Small space, narrow places...smaller is better? Fashionistas heading to the thrift store. Who needs wide sidewalks? enhanced streetscapes? Who needs a car to carry a lamp home? Everyone is out for their evening stroll. That is a mighty big steak? No dedicated bike lane? No problem? Fashionista at the world's most amazing thrift store. Now that is a tight parking spot. This photo is not upside down. Self serve wine - how good is that! For the past couple of years I have been taking photos of the best places to sit in Calgary and posting them on Twitter. I thought it might be fun to organized a few of them into a blog with supporting text on the benefits of sitting, thinking, relaxing, reflecting and talking. rest with the great achievement. "what is the great achievement?" it can only be expressed intuitively. the vastness of infinite space. secure the truth of the great achievement. the great achievement is beyond being useful. great words are simple and naturally awkward. mindful stillness subdues the frenzied heart. that guides the ordering of the universe." It is now possible to always feel loved and cared for, thanks to the efficiency of our “comment walls” on Facebook and seamless connection with everyone we’ve ever known. Your confidence and self-esteem can quickly be reassured by checking your number of “followers” on Twitter or the number of “likes” garnered by your photographs and blog posts. The traction you are getting in your projects, or with your business, can now be measured and reported in real time. Epiphanies may seem to come out of nowhere, but they are often the product of unconscious mental activity during downtime. "All of humanity's problems stem from man's inability to sit quietly in a room alone," wrote the French philosopher Blaise Pascal. It's a line repeated so frequently, in the era of smartphones and social media, that it's easy to forget how striking it is that he wrote it in the 1600s. I'd wager even Pascal would have been disturbed by a study published recently in Science, showing that people detest being made to spend six to 15 minutes in a room by themselves with nothing to do but think – even to the extent of being willing to give themselves mild electric shocks instead. It's natural to conclude that there's something wrong with such people. These are just a few of my "best places to sit" images. I expect there are thousands of "best places to sit" in Calgary and area. If you have a special place to sit, be it Calgary or elsewhere, I'd love it if you would email a photo of them to me (richardlw@shaw.ca) and I will add to this blog or perhaps if I get enough I will create a new blog. Thanks for reading. The Rise and Fall of the Grocery Store! Recently, I wrote that Calgary’s greater downtown communities are being well served by the numerous existing supermarket chains and specialty grocers. However, several readers questioned me about the need/opportunity for boutique urban grocery stores given the numerous condos popping up everywhere around the downtown. Their comments haunted me for a few weeks until recently, when west driving along 20th Avenue NW from 10th to 19th street (where there is a mid-century corner store every few blocks). I was reminded how Calgary’s inner city communities, when first developed in the ‘40s and ‘50s, all had “mom and pop” mini, grocery stores every few blocks. The mid-century corner store was critical to the walkability of those communities (back then it was one car per family). It was not large, in fact no larger than neighbouring houses at about 1,000 square feet. Some were two storeys; others had an attached home to create the equivalent of today’s live/work space. The stores were usually located on major community access roads (like 20th Ave NW) that were enroute to other places, making them very convenient. It had no surface parking lot, nor a requirement for assigned street parking - neighbours just accepted cars would pull up, get what they needed and drive off. There were no concerns about children’s safety, even though they regularly played on the street. It was a place where kids as young as six years old could be sent to pick up a loaf of bread, a jug of milk and even occasionally allowed to spend the change on a treat from the penny candy selection. It was also a time when people didn’t demand organic foods, exotic fruits from their favourite boutique orchard in Okanagan, farm-to-table vegetables or artisan breads.. It was a time of instant coffee and canned vegetables. People didn’t drive across the city to get their favourite coffee beans or find that specialty spice for an ethnic-inspired dish. It was all about basic foods bought at convenient locations. The “mom and pop” corner store, evolved into chain convenience stores like 7-Elevens and Mac’s, in the ‘60s, which served a similar purpose but weren’t located every few blocks. Jimmy's A&A Deli is located at the corner of 20th Ave and 13th St NW. Browns's Grocery is located at 20th Ave and 11th St. NW. Weeds Cafe is located at the corner of 20th Ave and 18th St. NW. I expect it was a grocery store when first built. Might bringing back the convenience store be something developers and city planners in Calgary should be looking at - both for established communities and new suburbs? Would creating a land use that would allow a small corner store every few blocks along access roads in new communities make sense? Would people support them? Perhaps the MBA yuppie types laid off in the oil patch might consider using their entrepreneurial skills to create the 21st century convenience store. Two good case studies for a model new convenience store can be found in Bridgeland, where both Lukes Drug Mart and Bridgeland Market, though very different, seem to be thriving. Lukes Drug Mart is very interesting model. Family-run since 1951 and today under Gareth Lukes’ leadership, it is more than just a drugstore - it is also a coffee bar (serving Four Barrel coffee from San Francisco), grocery store (basement) and hipster store (with numerous niche brands of specialty retail and dry goods). In this tiny store, you can buy groceries, have a prescription filled, access to Canada Post office and shop for unique items like Rifle Paper cards, Vance Family Soy Candles or Mast Brothers Chocolate. Did you know that Lukes was named one of the Top 11 new record stores in Canada by Aux (a Canadian specialty TV channel and website) in 2013? Yes, Lukes carries vinyl too! Bridgeland Market at the east end of First Avenue NE is a second example of a 21st century corner grocery store. Compared to Lukes, it is a more traditional mid-century corner grocery store but with a modern twist. They pride themselves on having some of the “rarest, freshest and most ethically created products in the community.” You can complete their “Product Request” form online if there is something you think they should bring in and sign up for Marketgrams for updates on when they’re cooking up something fresh. Along with artisan breads of all kinds, you will find croissants and “Made by Markus” treats like macaroons. Combine that with other offerings like Santa Cruz Lemonade and Green Cuisine tofu and you see how convenience food has morphed into today’s increased demand for organic comfort food. Both Lukes and Bridgeland Market are small spaces - less than 2,000 square feet (the size of today’s typical Calgary home) and certainly not to be confused with new urban grocery stores like Urban Fare at 30,000 square feet, (coming soon to Lower Mount Royal), a Shoppers Drug Mart at the base of a condo building (15,000 square feet) or a destination supermarket (50,000+ square feet). Bridgeland Market is located on 1st Ave and 10th St NE. Bridgeland Market's provides great local grocery shopping. All this thinking had me also wondering if the next evolution of grocery shopping isn’t the “bricks and mortar” local grocery store at all, but rather home delivery. With the rise of online shopping, one can’t help but think the next step in the evolution of grocery stores will be to bring back the 21st century equivalent of the ‘50s bread man and milk man. Instead of creating mega supermarkets or micro-grocery stores, everyone may well have a “Shopping List” App that links to a giant warehouse that will deliver your groceries and dry goods at your convenience. For those living in downtown condos, that would mean one less reason for owning a car. And for everyone, it would free up a lot of time for extracurricular activities. In fact, online grocery services already exist in Calgary. One is called Sustainable Produce Urban Delivery (or Spud for short) focusing on organic food. Sunterra also has an online grocery ordering and delivery service, as does Walmart. Home milk delivery was common place until the late '60s in Calgary. Hmmm….could it be that in the future, at least some of those monolithic Walmart and Costco sites will become mixed-use condo villages? Never say never! Dublin Revisited In 36 photographs! A year ago we were flaneuring the streets, pubs, museums and shops of Dublin, Ireland. As all good “everyday tourists” do on their one-year anniversary of a trip, I reviewed my collection of photos and revisited the many great memories of Dublin. Also this week, I received a lot of positive feedback from my Summer Sunlight photo-essay blog so I thought it would be fun to do a photo-only blog of Dublin. I have picked 36 photos (there is no magic in the number) that cover everything from art to architecture, food to fashion, parks to plazas and of course beer and pubs. In no particular order, the photos are in true flaneur-like fashion. Let the photos aimlessly take you on an off-the-beaten path stroll of Dublin. Everyday Tourist goes to gaol! Over the summer I have become intrigued by the different qualities of light I have encountered during my everyday walkabouts along the streets of cities and towns, parks, pathways and golf courses. I thought it would be fun to create a photo essay focusing on the diversity of light we encounter everyday. In the spirit of a photo essay I have decided not to include any text or captions with the photos, rather I will let each photo speak for itself. I have also tried to include only photos that have not appeared in any other blog. The photos have been chosen from the 5,000+ photos I took this summer and are not in any particular order - there is no attempt to create a narrative.